Commissioned by Hyperallergic, February 2017. 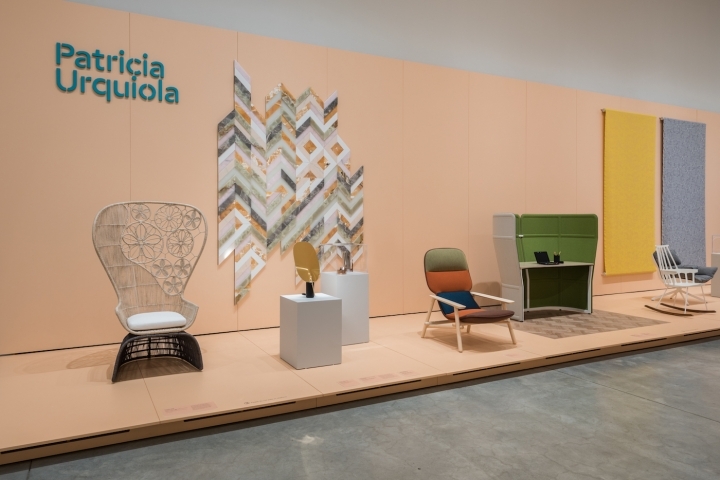 Patricia Urquiola’s new exhibition at the Philadelphia Museum of Art (PMA) is called Between Craft and Industry, as if that were a comfortable place to be. From the days of William Morris, the artisanal has always been seen as a counterweight to the industrial. Craft is local, not global. Individualistic, not efficient. Slow, not fast. But Urquiola wants to jump right over this divide. Her designs imagine a world in which there is no conflict between a company’s bottom line and the interests of its workforce. For the most part, she succeeds with this sleight of hand. Urquiola was born in Spain, but she has spent her entire career in Italy. She studied with Achille Castiglione, then worked in the office of Vico Magistretti, and gained a certain prestige through these connections to giants of design. But it was really Patrizia Moroso, the CEO of Moroso Furniture, that made her career. Moroso commissioned the earliest Urquiola work on view at the PMA, her “Fjord” armchair (2002), a witty play on Danish modern that alludes to the country’s coastline. Acquired by MoMA in 2006 (gift of the manufacturer), it was a first step in Urquiola’s rapid rise. She went on to work with other leading Italian manufacturers — among them B&B Italia, Kartell, and Flos — as well as the German porcelain maker Rosenthal, the Danish textile company Kvadrat, and the Michigan office furnisher Haworth. In 2015, Urquiola was appointed art director at Cassina, giving her a quasi-curatorial role at the highest echelon of Italian manufacturing. That’s a lot of companies, and it is no wonder that curator Donna Corbin describes Urquiola as “one of the most sought-after designers working today.” That term “sought-after” rings out like a shot, or maybe a cash register, in the hallowed halls of the PMA. It’s unusual for such a commercial designer to receive a monographic show at a major museum — even at this one, where the design group Collab has supported an annual prize and related exhibition since 1986. That first year, it went to a Pennsylvania hero, the craft furniture maker George Nakashima. In the three decades since, most recipients have been designers of a speculative and poetic cast, such as Gaetano Pesce and Marcel Wanders; architects, from Michael Graves to Zaha Hadid; or corporate leaders, like Sir Terence Conran, Alberto Alessi and Rolf Fehlbaum of Vitra. Very seldom has a commercial furniture designer been accorded the honor. Crinoline Chair (2008 for B&B Italia). Struck by this unusually frank observation, I contacted Antonelli to ask her about it. “The commercial aspect of design is to be celebrated, in museums, in academia, and in culture,” she told me. “It is not a hindrance or a flaw to be ashamed of, but rather, it is the point. Designers like Urquiola, the Bouroullec brothers, Hella Jongerius, or Naoto Fukasawa create the objects, from furnishings to inexpensive accessories, that populate our lives.” With this in mind, one wishes that the PMA had named the artisans who constructed these objects. The designer is quoted as saying, of her gorgeously ornate high-backed “Crinoline” chair (2008 for B&B Italia), “I gave birth to it with the people who were working on it with me.” Some of the makers appear in a photograph on the wall, somewhere in Asia, and maybe by the standards of the furniture industry this counts as radical transparency. But it’s far from the full picture. Craft thus lends credibility to the proceedings, while remaining decorously offstage — which, in Italy as in many other places, is the norm. As Catharine Rossi has written, the country’s unusually robust artisanal base has served the manufacturing sector well, even as ancient hierarchies of labor have remained intact. Urquiola stays within this paradigm, asserting her authorship even as anonymous Nepalese and Indian weavers make her rugs. Again and again, she has deployed the rhetoric of artisanal quality within a production line. Still, Urquiola is ingenious. Another chair, called “Husk” (2011 for B&B Italia), is not her prettiest — it resembles a bunch of angry sofa cushions tackling a frame — but it is fully recyclable, in that each upholstery element can be re-used for other purposes. As this project suggests, Urquiola is commendably attuned to narratives of sustainability. An exhibition highlight is the “Earthquake 5.9” collection (commissioned by Budri in 2012), which incorporates fragments of marble and onyx damaged by a 2012 earthquake in Emilia. It evokes hope in the wake of tragedy. Given the quality of her work, it seems entirely appropriate that the PMA has given a platform to Urquiola. It’s true that commercial pressure shapes almost all her projects. She always balances cost against quality, and doubtless much of her time is spent in cajoling her manufacturers. She’s a smooth operator. But, to quote Sade’s 1984 hit of that title, Urquiola does often achieve “minimum waste and maximum joy.” Design has its own unavoidable calculus. Sometimes it’s a pleasure just to see someone do the math.